Vancouver’s large human population, mild weather and proximity to shipping ports make it a haven for rodents- particularly rats. Rodent populations seem to be on the rise over the past few years, and unfortunately this seems to be a trend that shows no signs of abating. Mild winters, long hot summers as well as city mandated food recycling programs are are just some of the reasons why rodent populations in Vancouver continue to grow. Also called common rats, brown rats, sewer rats and a host of other names the Norway Rat (Rattus norvegicus ) is perhaps the best known and most common rat. They are grey or brown colored rodents, with a body length measuring up to approximately 25 cm, with an equal sized tail length. They are heavy in appearance, having thick bodies with blunt muzzles and small, close-set ears. Their tails are shorter than their bodies. Adult males weigh on average 350 grams, while full grown females weigh in at about 250 grams on average. The name “Norway Rat” is a bit of a misnomer as the rat does not originate from Norway, but instead was native to China, and was spread throughout the world by humans via ships. Today, this rat species exists on every continent but the Antarctic and the Arctic. Norway rats are found in garbage dumps, in various buildings and areas on farms (particularly around grain), burrowing under buildings, and living in burrows around rivers, streams and waterfronts The brown rat is a true omnivore and will consume almost anything, but cereals form a substantial part of its diet. They are very adaptive, and have been known to dive for shellfish, hunt fish, and even hunt and kill marine birds for food. The Norway rat’s gestation period is approximately 3 weeks. In optimum conditions they can breed about every 10 weeks, birthing anywhere from 7 to 14 pups at a time. In turn those pups can reach sexual maturity within 5 weeks, and in favorable conditions that original population of 7 to 14 rats could multiply by a factor of 10! In perfect conditions a Norway rat’s lifespan is about three years. Lucky for us, living outside is difficult for rats, and through fighting with other rats (competition for food and females), predation by other animals, and active pest control practises, 95% of Norway rats don’t live past their first year. Roof Rats (rattus rattus), a.k.a black rats, house rats or ship rats are originally native to southwestern Asia, and over the past 2000 years have spread throughout the world to become wildly successful on almost every continent on the planet- save Antarctica and the Arctic. It is thought that roof rats spread through spice shipments from India to the Roman Empire, and from there colonized Europe. When Europeans began colonizing the rest of the world the roof rat was right there with them, and it wasn’t long before they had set up colonies all over the New World. Roof rats, by comparison to Norway rats, are more graceful and slender in appearance. Their muzzles are more pointed, and they have large floppy ears. Roof rats are smaller than Norway rats, and an adult male typically measures about 12 to 18cm, weighing in at about 110 to 340 grams. One of the most diagnostic characteristics of roof rats are their tails- they are as long (or longer) than their bodies. Roof rats are often found “off ground”, and can be seen climbing on trees, vine covered fences or up the sides of structures to nest inside roofs. They are fantastic climbers and their tails act as a fifth appendage helping them to balance their bodies while traveling, thus giving them fantastic manoeuverability. 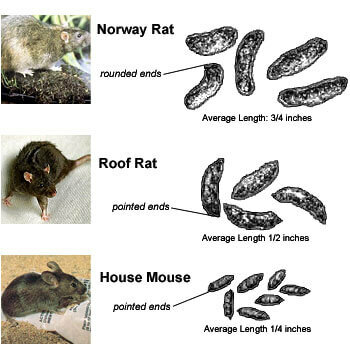 The breeding and feeding habits of the roof rat are, by and large, very similar to the Norway rat. They are omnivorous and opportunistic when they feed, and if their populations are not kept in check they can quickly become a large problem. Although rats are actually very clean animals, they do have the ability to spread diseases which are potentially fatal to human beings. Some of these are diseases carried by the rats through parasites such as fleas (the Bubonic Plague), while other sources of infections are carried by the rats themselves in the form of bacteria or viruses which can be spread to human populations through direct or indirect contact. Toxoplasmosis, trichinosis and typhus are some of the other diseases that rats are capable of transferring to human beings. In addition to disease, rats can cause a great deal of property damage is left unchecked. They will often mistake wires for vegetation and as a result have a fairly good track record of causing electrical fires- particularly on farms. Try to make sure that there are no holes in the walls, ceilings, floors or roofs of your buildings. Seal them with expandable foam and/or wire mesh. Remember: a full grown rat can squeeze himself through a hole the size of a quarter. Ensure that vegetation around your structures is kept trimmed and properly managed. Ensure tree branches do not touch the walls or roof of the buildings, as these will be easy for rats to scale and gain access to structures. Avoid using bird feeders. Seed from feeders will rot and become very aromatic and will become a strong attractant to rats and other rodents. Ensure food scraps are kept inside closed approved municipal recycling containers. Ensure the containers are not damaged, and do your best not to overfill them. Unfortunately, as diligent as you may be, sometimes it is just not possible to deter rats from your property. In situations such as this, a properly devised trapping and/or baiting program can be a very effective method or control and possibly complete eradication. Call Local Pest Control to arrange a environmentally sensitive trapping program and to help prevent them from coming back.